Another fine hybrid from Alan Bremner, suitable for the border or large rock garden and also effective on slopes and banks. The plant has a scrambling habit with long leafy stems and dark green leaves. The dark reddish-purple flowers have veined petals. This is a wonderful cranesbill giving valuable late season colour, often flowering into late November with us. 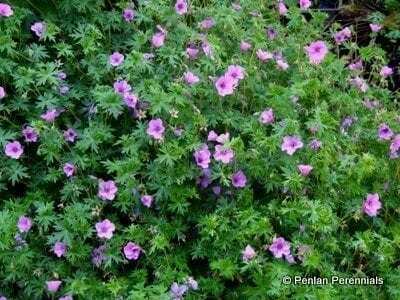 Deservedly awarded an AGM at the 2005 RHS Geranium trial. Named after Dr. Dilys Davies. Hardiness rating H7. Propagate by stem cuttings in late summer. Pest and disease resistant.